There’s nothing quite like a homemade cookie – each soft bite filling you with scrumptious and nostalgic pleasures. 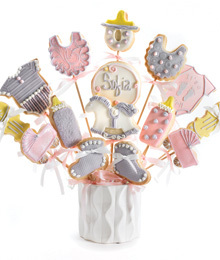 The Cookie Messenger holds these age-old sentimentalities close to the heart with each stunning and delicious cookie bouquet it creates. “It’s a feast for the eyes, as well as the palate,” says Daniela Nicosia, co-owner of The Cookie Messenger, Canada’s only cookie bouquet company. Along with her partner, Gioia Grandinetti, the pair creates colourful arrangements of edible art that are ideal for any occasion. For spring celebrations, a pastel floral bouquet will break the mould of conventional sweets, and with Mother’s Day around the bend, a personalized family bouquet with your mother’s photo as the centrepiece is a unique and considerate way of expressing appreciation. 71 Strada Dr., Unit 1, Woodbridge, Ont.